You will not find this SFO anywhere else. The Worked Blade is a painstaking process done by hand by Case Artisans. We have not seen a worked blade by Case in 20-30 years that we know of. This knife also features a Worked Backspring which has not been done by Case for many years. The craftsmanship of this spectacular knife is vintage Case. The blade is Swedged and Hand Worked and features a French Nailnick. The Backspring is also worked by hand. We can now engrave on the shield. Please note that the photo shown for example has scrolled bolsters and this model does not have scrolled bolsters. This knife is a special factory order (SFO) which means it is made by Case only for us. You will not find this knife anywhere else. The historic badge shield was the shield used by Case Brothers at the turn of the 20th century. The company’s rich history began in 1889 when four brothers - William Russell (W.R.), Jean, John, and Andrew Case(a.k.a. “The Case Brothers”) began fashioning knives and selling themalong a wagon trail in upstate New York. W.R.’s son, John Russell (Russ) Case, a former salesman for the Case Brothers brand, launched W.R. Case & Sons around the turn of the 20th century. Proud to call you Dad. We can also engrave the back of the Clip Blade. There is room for longer messages on this blade. Give us a call and we can help you make this knife a very special gift. Some suggestions for the back of the blade. Grow old with me. The best is yet to come. Growing up with you Dad. Those were the best of times. Proud to have made you proud of me. Proud to call you a friend. 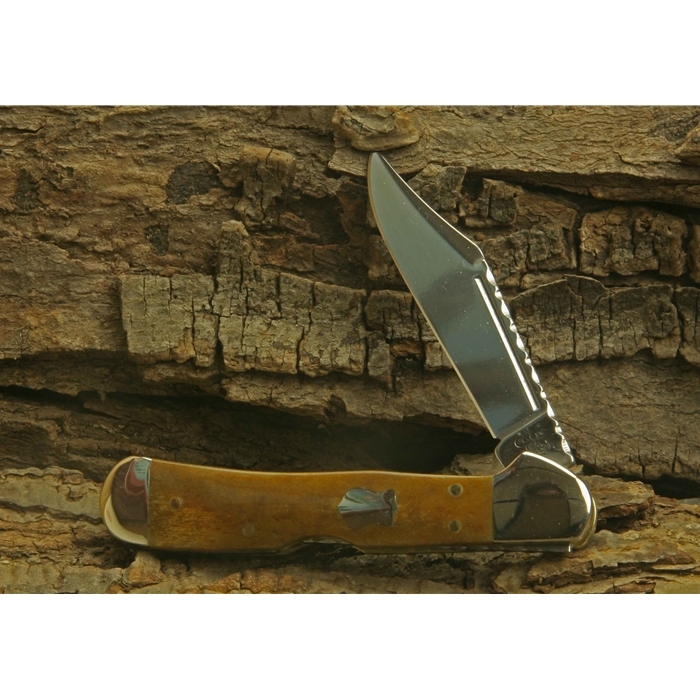 An engraved Case pocket knife will be carried every day and the messages will be revisited often. These messages will last a lifetime. We can engrave your company logo on this blade. Give us a call at 877-564-3399 for further info. Select the Engraving you would like. If you select Script, it should not be all capital letters. Goudy is the actual font we use for Block. Enter the information you would like engraved. Please double check your spelling, capitalization and punctuation. If you select Script, you should not have all capital letters. Maximum Length is 22 Characters including spaces. Select the Engraving you would like. If you select Script, it should not be all capital letters. Goudy is the actual font we use for Block. Goudy is a rich font that builds it's characters with five passes of the diamond. Script characters are built with one to three passes of the diamond. Enter the information you would like engraved. Please double check your spelling, capitalization and punctuation. If you select Script, you should not have all capital letters. Select the option you would like for the Bolster. (This is the Nickel Silver part on the handle where the blades meet the handle) Block is recommended. This Premium process darkens the engraving into the steel and changes the color of the engraved area. The color and the engraving are permanent. Once you have selected the option to engrave on the shield you can enter the Initials or Age/Year/Years of Service/Years of Marriage - 4 Characters Max. We will engrave in a horizontal format. The font will be block.